In the three years 2009–11 there were 3830 serious worker’s compensation claims due to a fall from a Ladder – equivalent to a staggering three injuries every day requiring one or more weeks off work. The construction industry is the most dangerous for ladder use, with falls from ladders being the most common causes of fall-related injuries and fatalities, according to data in a 2013 Safe Work Australia (SWA) 2013 falls from height report. Interesting, many of the falls that lead to injuries or fatalities did not occur from significant height. Fifty per cent of fall-related deaths between 2003 and 2011 resulted from falls of three metres or less with falls from ladders accounting for the greatest number of deaths. When a fatality occurs, head injuries are the most common cause of death, with 76 per cent of the 112 workers who died from a fall from a height in the four years 2008–11 doing so because of a head injury. This is consistent with the story of Peter Haines whose Pro Choice V6 hard hat saved his life after he fell five metres from a ladder. “They think that was what saved me from sustaining head or neck injuries. The impact was so hard it cracked the hard hat,” Haines said. When working at heights, Pro Choice Product Development Manager, Brad Rodgers suggests wearing a hard hat from their Airborne range due to the four-point chinstrap securing the helmet in the event of a fall. “It also has a 10 mil peak to allow a greater field of vision while working at heights,” Rodger said, adding that the V6 or V9 Hardhat’s adjustable ratchet harness had kept the hard hat on Haines’ head during his fall, but a chinstrap is a safer option. Executive Director of SafeWork NSW, Peter Dunphy stated that most incidents involving a ladder occur when it is used incorrectly. Ladders should be placed on a flat, stable surface and workers should maintain three points of contact with it at all times, Dunphy said. “Two hands and one foot, or two feet and one hand on the ladder and never lean or reach away from the ladder while using it,” he said, adding that workers should not carry large or heavy items while on ladders. Anti-slip gutter stabilisers and leg levellers are also recommended. Where possible, Dunphy suggests working from ground level or using alternatives such as scaffolding or an elevated work platform where possible, only using ladders for simple jobs and short periods. 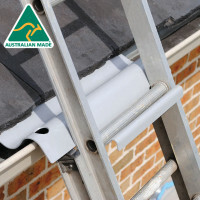 Where there is no alternative he said ladders should meet Australian Standards and the load requirement of the job and should be inspected for damage before each use. SafeWork NSW do not recommend the use of fall arrest equipment on portable ladders due to a lack of strength and stability. However they said there may be some occasions where fall arrest equipment may be appropriate when using fixed ladders, such as when recommended fixed sloping ladders with cages are not possible due to site limitations. “A solution to reduce the risk presented by the use of a fall arrest system with a ladder is to consider whether an elevating work platform or scaffolding would be safer and more efficient,” the spokesperson said, adding that fall arrest is a lower order control measure. “When using fall arrest operators must be appropriately trained, rescue plans must be developed and fall arrest equipment must be regularly tested and maintained,” they added. Extension ladders should be angled at a ratio of 1:4 and should be secured top and bottom. Failing that someone should hold the ladder in place. Do not climb or work past the second-last rung of a ladder and when climbing down, remain facing the ladder and climb to the bottom rung before stepping off. A-frame ladders should only be used when locked in the fully-open position. Never straddle the top of an A-frame ladder. Platform ladders could be safer than an A-frame or extension ladder.